Playing in table tennis competition is not easy for beginning or amateur players. It can bring out the best or even the worst in any player. Any form of weakness in your game can be used against you by your opponents in a tournament. 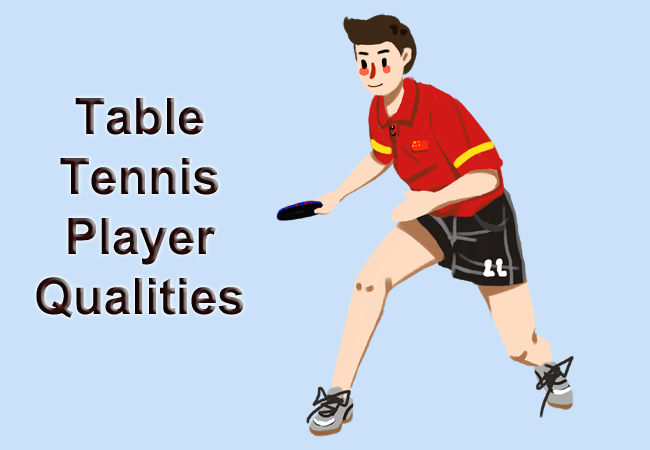 This guide will explain the five qualities of a table tennis player that can help beginners or amateur players to become competitive and win more matches. It will take a lot of training and practice to become a good table tennis player. Here are five essential qualities to make you become a better player. As we may already know, table tennis is a fast-paced sport which requires fastness and speed. The serves, strokes, and footwork involve the use of speed and quickness. Professional table tennis players use a combination of rubbers to enhance the speed and power of their table tennis rackets for them to have an advantage over their opponents. Prior to the discovery of the sponge rubber racket, the game of table tennis did not require much speed but with the introduction of the sponge rubber, the game became a fast-paced sport. If you are not having enough strength to do your shot, you need to take a look at how you make the shots. Generally, it is not the problem of the arm. You don’t need to move your arm when making a shot, you should focus on the strength of your waist instead. When you hit the ball, you move your waist first and use the waist to make your arm move. Even though your arm didn’t exert the force, but it still requires to move. Before hitting the ball, you need to contract your arm instantly, rubbing the ball together with the combined force of the arm and the waist, so that the ball can have great spin. You no need to study the ratio of friction and impact. Even professional players are not focused on these. They just deal with the ball according to the data. The best way for you to increase the speed of your shot is to find someone to learn the skill of playing arc shots. You may search for some tutorial books online to get some special guides for beginners to learn how to play table tennis the right way and the quickest way for beginners to develop the right table tennis skills. There are two types of skills in table tennis, the basic and advanced table tennis skills. The basic skills are required to start playing the game from the beginning to the intermediary level. A good table tennis player must be able to master basic and advanced skills. When you just start to play table tennis, you can get a pre-assembled racket like the Stiga Pro Carbon or Killerspin Jet 800, you no need to buy blades and rubbers that are for professional players since you still not reach that level yet. Only when you have played table tennis for some time, and your overall skill improves and progress well, then only you can start to consider in buying blades and rubbers that are catered for professional players. If you are serious in playing the game, you should find a serious partner and practice the basic strokes with him. It is best for you to start playing loop with your partner. Do for more loops and play as many as you can with a long time without losing the ball. By doing this, your playing skill will gradually improve. Then you can start to train your forehand and backhand with different strokes. A good table tennis player must be accurate in their techniques. Professional players execute the powerful and accurate shot to be able to dominate their opponent. This is one of the qualities of Chinese table tennis players that make them become the best players in the world. To improve your accuracy, you can make use of the table tennis robot to throw multiple balls. You then move with the corresponding direction. This is to train the collaboration of your eyes and feet. Your eyes see the ball and your feet should keep up with the pace, and use your racket to hit the ball. When the eyes see it, they have the basic judgment and your hand will be able to adjust to do the accurate shot. There are no shortcuts other than keep practicing. You can try to hit the ball the drop point where you want the ball to drop to. Let your table tennis robot oscillating and shoot the ball in the different direction, you can then move and hit the ball to the same drop point and make sure that it accurately drops to the place where you want the ball to drop to. Another good quality of a table tennis player is to be able to anticipate the actions of their opponents. By applying effective tactic and strategy a player can be able to calculate and anticipate the action and reaction of their opponents. A professional player always tries to anticipate his opponent’s serves, returns, and strokes. The quick judgment ability is the premise of fast movement. When it comes to starting the way, everyone knows that the footwork must be fast and the movement must be fast. However, before moving, you should first develop the habit of focus at the ball. You should always observe the momentary action of the other player’s racket and the direction of the ball. In order to anticipate the landing point of the ball, you can move to the most suitable position as soon as the opponent return the shot. Footwork is one of the most effective qualities of a professional table tennis player. The modern table tennis game is full of attacking players, so the ability to be able to return offensive and aggressive shots will depend largely on very good footwork skills. Many players like to practice fixed-point while performing footwork training. For example, side-to-side speed training is not really effective when playing in competition. If you want to develop good judgment ability to achieve rapid movement in the game, you need to do some irregular footwork exercises. In the beginning, amateurs can master the basic movement method through fixed-point exercises. After proficiency, they must consciously practice the indefinite movement. If you can master the above five qualities, you will be more competitive when playing in table tennis tournaments and win more matches. Great ,l guess you’re a coach.